Hopkins has been moving towards reconstructing Blake Road, and along with Hennepin County, Edina and St. Louis Park—plus the MCWD and Three Rivers Park District—conducted a corridor study of Blake Road/Aquila Avenue. Blake was widened decades ago when it was a route to major industrial sites along the railroad to accommodate truck traffic and the wide turn radiuses and lanes they require. The road is currently a rutted stretch in some heavily driven parts between 2nd and TH 7. June 25th there was an open house to the pubic, held at Eisenhower Elementary School, shuttle busses were provided to offer access to the lower income Westside Village Apartments. I attended this and listened in on others as much as I gave feedback. Another Open House will be coming where the proposed alternative designs will be presented. There were a lot of voices expressing hope for improved bike facilities along Blake. Just looking at Blake and you can see why everyone also hammered home how awful crossing Blake is for pedestrians and cyclists along the entire length, and for cars at Lake St. and entering and leaving Westside Village. I was surprised the number of people hoping for traffic circles at Lake St. and at 2nd St. NE. Amazingly the study even presents a roundabout alternative. Late fall 2014 a final alternative will be presented. Winter 2014/15 the final implementation plan and final report will be prepared. Currently according to the latest capital improvement document the city of Hopkins is budgeting $10,000,000 over 2017-18 for construction, to be completed before SWLRT arrives. I've grabbed a few of the b/w attachments the consultants included in the packet given to the city council. Wish they were clearer, but they are what they are. I hope to attend the coming work session on Tuesday Sept 9th, but we'll see. Note: Amid the cluster of five small apartments between Lake and Hiawatha is a small plain building housing a Met Council pump station I was told. It needs replacement/upgrading soon, maybe even enlarging. At the June open house the corridor maps plotted these five apartments as a high density redevelopment opportunity because Met Council might need to take one apartment for the pump station. Thought is the owner of the five apartments might rather sell all five rather than one. The Roundabout alternative. You can see how much space they take, they're huge. Also clear is how far the bike accommodations would be needed to make way around them. I'm fond of the traffic circle option, but the space considerations made me double take. Westside Village Apartments are in a very tough position. Excelsior Blvd was reconstructed and blocked entrance from eastbound Excelsior. Now reconstruction of Blake looks to block entrance from southbound Blake. Seriously screwed. So one alternative keeps a crossing at "Hill Street". You can witness any given moment residents of Westside scampering across Blake to the grocer, Goodwill, and restaurants on the west side of Blake. Part of the danger isn't so much the pedestrians taking the desire route directly across, but that Excelsior westbound has a high speed pork chop island turn lane. Cars coming from Excelsior are at high speed going around the corner. Happily all alternatives so far remove the pork chop turns. Above is an alternative with a proper pedestrian crossing with the entrance to Westside preserved. Last edited by Anondson on September 7th, 2014, 7:15 pm, edited 1 time in total. If you're into the roundabouts, you should push for two lanes instead of four. Lots of streets with Blake's level of traffic operate well with two lanes and turn lanes, especially at lower speeds. Based on the addition of medians, I'm assuming they're looking at higher speeds for it. Is it posted 35mph currently? It should be 30, and at that speed there's absolutely no need for median barriers. If there weren't four through lanes, the roundabouts could be quite a bit smaller. It will be tough, because the Met Council is projecting massive population growth for the area, but a good counterargument is that the higher population will drive at a lower rate. Yep it should just be 2 lane. that's what I'm going for. It would add space for pizza lucé too! Definitely should be two lane. That road has been overbuilt for 30 years. Blake has a ton of potential. A two-lane option should include a circulator bus route that serves Interlachen Park, the Blake school, Knollwood, the Target strip, Aquila and Methodist hospital. I'm thinking a route from Louisiana & Excelsior Blvd., N. on Blake/Aquila, west on W. 37th, north on Boone, east on W. 36th. north on Aquila, east on Minnetonka Blvd. and south on Louisiana. This would hit all of the Hopkins residential in the area and a good chunk of the SLP residential north of the mall. It would take a lot of traffic pressure off both Blake and Louisiana. The Knollwood/Target area is a big trip generator from points south. It would also connect the 12 and 17, making those even more useful regional routes. And it hits two LRT stations. During nearly all day Blake isn't carrying four lanes worth of traffic and in justify a road diet from five lanes to three lanes. Blake's challenge is the back up caused waiting to cross TH7. Cambridge is so near TH7 that the overly long lights crossing cause congestion backing up into the Cambridge intersection, especially at rush hour. Removing those lanes will make TH7 back ups even worse. It is too bad this can't involve a TH7 grade separation right now. I believe the traffic counts are borderline justifying four traffic lanes but if it weren't for needing places to store cars waiting for the TH7 traffic lights we would have a strong case for three lanes on most of Blake, from Hill Street to Cambridge. Anondson wrote: During nearly all day Blake isn't carrying four lanes worth of traffic and in justify a road diet from five lanes to three lanes. Blake's challenge is the back up caused waiting to cross TH7. Cambridge is so near TH7 that the overly long lights crossing cause congestion backing up into the Cambridge intersection, especially at rush hour. What if something like this (https://i.imgur.com/LbnXdXE.jpg) was done? Create an on-ramp tunnel to West 7 off Cambridge street. That would remove the left turn congestion to West 7 from Blake. 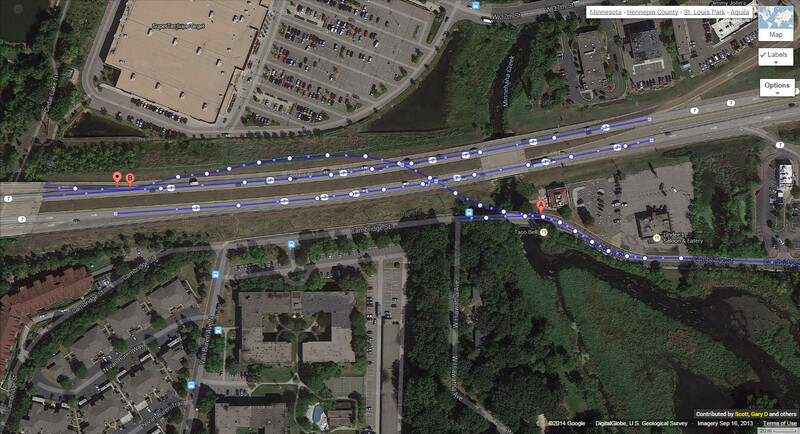 And even the eastbound 7 exit to Blake could be directed to Cambridge street. I'm no expert so this may be one of those dreams that would cost much more than it's worth or couldn't even be done given the surroundings (wildlife, buildings, city ordinances, etc). Hmm. I'll just pipe up that I've had an idea or two for rerouting the North Cedar Lake Trail through there -- that was in the context of rerouting the TC&W rail line, but it might make sense anyway to try to make the trail make more direct connections between where people live, work, and shop rather than sneaking behind them. My thought was to go straight north from Tyler Ave, but I also see a clear desire path in your image across MN-7 at Van Buren Ave. If someone were to go through the effort of redoing MN-7 to rearrange automotive traffic flow, it would be important to improve things for cyclists and pedestrians as well, even if it's just putting in some more connecting paths to the existing Cedar Lake Trail. I mentioned at the open house that they might be able to reduce Blake-Aquila cross traffic (and the congestion backed up at Blake) if the you in some underpass linking either Hiawatha or Van Buren to the Target driveway under TH7. I pointed out there were many people living in the dense cluster of apartments who hike way up onto the towering berm the highway is built on and scamper across the highway and back down. They all stared at me like I was telling them people were playing Frogger on the highway, as you can see, the evidence is right there since people do it so much it has worn a path! Target might object if it were an auto underpass, but not if it were a pedestrian and bike underpass. But why not walk to the trail from the apartments? There isn't official access except holes in fences and the goat path along the steep highway slope. They made some notes about trying to improve full public access to the bike trail to give pedestrians an easier route to Target and the shops near it. Would it reduce some car traffic across Blake to Target? I imagine it could. At the open house I spoke with staff from St. Louis Park about the possibility of Blake-Aquila becoming grade separated like Louisiana and Wooddale. He mentioned that MNDoT had approached Hopkins and St. Louis Park and said they were very open to seeing it happen and would help how it could to happen on an accelerated time table ... but wouldn't pay for a dime. Much like how SLP paid out its coffers a huge chunk for the separating of Wooddale and Louisiana but with some federal dollars. SLP got federal funds for Wooddale and Louisiana because those improved access across/through the city, specifically emergency response times. Blake-Aquila is at the city borders so doesn't affect response response times. I used to visit the Westside Village apartments on a semi-regular basis. It was funny because we hardly ever walked to any of the nearby businesses during that time. I think once we walked across Blake to a store and just ended up crossing at the Excelsior/Blake intersection. It's interesting to see that they are considering a crosswalk at Hill Street. Very few considerations like that have been made up where I live. A pedestrian crossing to close to a signalized intersection like that would be considered "wasteful" by the County. I think if the refuge median were larger and if the grade of Blake were flattened so that the terrible sight lines disappeared, the situation would be better for pedestrians and the crosswalk may no longer be needed. Given the short hop that Blake makes between Excelsior and Hwy 7 I can see why it's built as big as it is and why it might get used so much. People are going to cross by those apartments regardless of the accommodations, because it is legal to cross there. Hopefully, accommodations are put in only if they improve safety and/or actually cause people to want to use the crossing more. In regards to the pedestrian bunny path across Hwy 7 over to Target, I think that is hilarious, because it is so well developed. If you look at Google Earth, it appears like someone was even mowing the grass around the bunny path on the Target side of the connection. The grade of Highway 7 lends itself nicely to a tunnel, but it is difficult to build one since it only connections to private property on the other end. Unless Target is interested in footing the bill, I don't see how it could happen. It doesn't seem like a good use of public dollars because it mostly benefits a private business and people frequenting that business. I think that a better connection to the Cedar Lake Trail from Cambridge St is definitely in order. This might be hard to negotiate as well though since it requires passage along MNDOT ROW. If MNDOT is feeling nice, they might give up the ROW but that would probably mess up a Hwy 7 corridor that's uniform in width. The other option would be to see if it could come out of private property. "Mr. Heppelmann explained that pedestrians would need to walk to Cambridge Street crossing to access restaurants. Studies have shown that mid-block crossings increase crashes." "Mr. Heppelmann discussed that the current traffic volumes in the corridor is 15,000 vehicles per day with a future projection of 17,000-18,000 vehicles per day." "Mr. Heppelmann discussed that the improvements to TH7 intersection will help eliminate neighborhood cut-through traffic but widening of the intersection creates pedestrian crossing difficulty. The St. Louis Park City Council did not like the idea of widening the intersection or interchange options. The St Louis Park City Council discussed the possibility of a pedestrian bridge at TH7." The second open house is to be held Thursday Oct. 9th, between 6–8pm, again at Eisenhower. I'll be going. - West Side apartments keep their main entrance on Blake. - 10' multi-use trails separated by a six foot boulevard are on each side on Blake. There wasn't enough room for a true cycle track separated from a sidewalk... so multiuse trail it is. - Even with traffic counts under 6,000, Aquila to stay five lanes. - MNDoT "implied" putting a pedestrian bridge over TH7 would be an unwise use of funds. - Excelsior's huge pork chops on the northeast and northwest corners of the Blake intersection will be eliminated. - the large pork chop at 2nd and Blake will be gone. - there will be no access to turn into the fast food restaurants from northbound Blake, U-turns will need to be made at Cambridge. A 10-foot median will be installed there, clearly a pedestrian refuge. - South of Excelsior, Blake's gravel parking strip is being eliminated, a 10-foot multiuse trail replacing it. Blake School is going to have its own reconfiguring of its athletic fields, it will put in a parking lot behind its new baseball diamond to replace the lost parking. - the shameful narrow sidewalk on Blake between Boyce and Excelsior on Blake's west side (that currently has bike traffic routed on to!) will be replaced with a 10-foot multiuse trail. - and the most controversial element stays, that is the two block long sidewalk in Edina on Blake's east side from Spruce to Maloney. Heh. You left off the most important piece of information - Is the whole thing still going to be 4-5 lanes between MN-7 and Excelsior? Heh, sorry about that! No change in the number of lanes, though some spots will have their turn lane dropped. The turn lanes to the fast food, turn lane to Oxford, turn lane to Hiawatha all being cut and the median put in place. So yeah, still a 4–5 lane road. They never entertained reducing lanes because of the train tracks. Today a freight train comes through and backs up traffic into Excelsior. The lanes are seen as a very inconvenient congestion holding space. The city engineer admitted that were the tracks not in the way they would have prioritized dropping it to a 3-lane street. Grade separating freight would have harmed the businesses and apartment access so much it wasn't considered, so we get the barely needed lanes. Badly needed in the sense that when train traffic isn't occurring it's not needed. The city engineer said the county grade separating the bike trail is very very likely. There will be a dedicated midblock pedestrian crossing between West Side and the retail across Blake. I'm glad to see that, acknowledging people will obviously cross where it's easiest as they are doing it now. In the next Hopkins council agenda it mentions the city and Hennepin county are reaching an agreement that after the reconstruction of County Road 20 (2/3rds of a mile, Blake Road from Excelsior Blvd to TH 7) be transferred to the city, no longer be a county road. I'm still hoping the once the city has the road they get around to doing what they can to reduce the speed limit to 30. The design is going to have 10'8" lane widths but leave the 35 mph posted limit the county has now. I seem to recall, I think it was froggie who mentioned a city can declare an area an "urban district? ", and this makes reducing posted speeds a bit easier. The properties set far back though are set to be redeveloped. The Cold Storage site is going to be redeveloped with buildings up to the sidewalks, as will the shared development wrapping the Blake Road LRT parking structure. 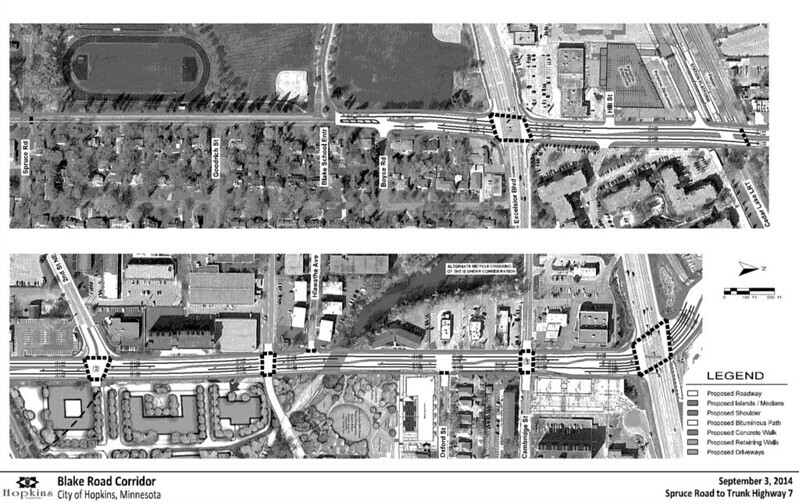 F&C on the Hennepin reconstruction of Blake (County 20) prior to LRT opening, with the intent to build Blake Rd. to be handed to the city.